​Are you looking for qualified applicants to fill open positions? Are you having trouble finding candidates that fit your company’s job description? Do you need someone with a particular set of skills in a specific part of the state, region, country, or world? Whether your project or job opening is temporary or long term, field or office work, domestic or international, Attentive Safety Staffing can help! Headquartered in Marietta, GA, Attentive Safety Staffing provides staffing services to small, medium and Fortune 500 companies throughout the US. Attentive Safety Staffing provides and administers all compensation, benefits and taxes, without the client having additional overhead. We can augment an existing in-house safety team with additional expertise for specific projects. ​Our NETWORK = ONE STOP Access to all the Employees You Need! We have access to a plethora of qualified candidates in our thriving database, from entry level all the way to your hard to find executives, and we make the connection between job seekers and potential employers! If for some reason we do not have the person(s) you are looking for, then we will find them! The below details will help Attentive Safety Staffing get a sense of your corporate culture and what type of professional is likely to succeed in position. As soon as we have clearly defined what you’re looking for in a candidate, we can begin searching immediately. Per Diem - ​Hiring per diem staff is an efficient, cost-effective solution to cover last-minute shift cancellations, census fluctuations, or other immediate demands. Direct Hire Placement - We connect job seekers and potential employers for the purpose of establishing a permanent employment relationship. 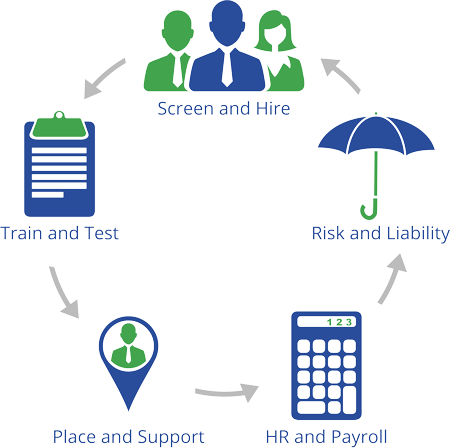 Temporary-to-Hire - Attentive Safety Staffing employee will work for a client during a trial period during which both the employee and the client consider establishing a permanent employment relationship. Long-Term Staffing - Attentive Safety Staffing supplies employees to work on long-term assignments. Our employees are recruited, screened, and assigned by Attentive Safety Staffing in accordance with the customers' needs. ​We have trained professionals on staff, but if they do not meet your training requirements, then we can help! If you have someone already in mind but they do not have the experience to fill your open position, then we can help train them as well!